I would like to strongly recommend Steve Randy Waldman’s recent post on “Discretion and Financial Regulation.” He begins like this: “An enduring truth about financial regulation is this: Given the discretion to do so, financial regulators will always do the wrong thing.” It gets better from there. In fact, I’d recommend it over anything I’ve written this morning, so why don’t you head over now. This entry was posted in External perspectives and tagged regulation. Bookmark the permalink. We need to restore all the things that were removed during the 1990s, by CLINTON and the DEMOCRATS(who are really REPUBLICANS), such as Glass-Steagall(sp.? ), regulate derivatives, or possibly ban them because they’re too complicated for us to understand. All this in-depth theoretical talk is not needed, it’s just a distraction from the fact that Obama did nothing about the banks, we’re in a liquidity trap, we have zombie banks and this crisis is not over by any means. The real issue in my opinion, is the need to put Citibank, and everyone else through bankruptcy, that’s the only thing worth talking about, if it’s not happening then the only thing worth talking about is WHY it’s not happening. Why aren’t the futures markets being regulated so that speculators can’t manipulate the price of oil and other commodities? If you’re not talking about why this isn’t happening, then a waste of time is being had by all. It isn’t complicated at all! Those that are reluctant to be regulated will persist in making both sides of the argument for regulation complicated as a means to confuse he general public into thinking that the lack of rules is the good way for everyone. If precise clear cut policies and laws were put into place then the financial industry as well as th Fed and taxpayers would all be safe, and have a better understanding of how this mechanism of society works as a benefactor and not a drain. Steve Waldman does a good job as usual. Neither Barney Frank or Chris Dodd’s draft legislation is THOROUGH or COMPLETE enough (an understatement if there ever was one). Chris Dodd’s draft is just slightly better. The sad thing is, I think both Dodd and Frank KNOW that their draft legislation isn’t thorough enough and they are willing to let the crisis happen again and then claim innocence or use the politician’s cliche “well, I went farther than most politicians did”. Waldman’s words there are a kind of subtle genius. Yes, VERIFIABLE TARGET MARKET STRUCTURE. That’s the trick isn’t it??? A DEFINITIVE target number that initiates or REQUIRES action by the regulator. That should be in Dodd’s or Frank’s final draft. And unless Democrats get smart and realize this is a terrific chance to show American voters they have more financial responsibility than Republicans, they will F*#^ up a golden opportunity. As far as resolution is concerned this is where I differ with Waldman. To put fear (and therefor responsibility) into big bank CEOs the threat of bankruptcy has to be there and an eminent danger when taking too much risk. And after you have bankruptcy, there is no other choice than resolution that I can see. I read it… good stuff. But, who is he? Basically I agree that the problem of given the Fed et al discretion in these matters is that they would have the ability to not act. If we have to make things Sarah Palin-proof we’re doomed. Watch the 2 minute youtube video below. Listen carefully and make sure you watch clear to the end. Yes. She is but one of many public figures that has adopted a preconceived narrative (in this case a myth of the “evil atheist liberals”) and then twisted reality into something that fits that mold. I’m not sure what this has to do with the article James linked us to, but, yeah, like Sarah’s not going away, or, more importantly, those nebishes that she attracts. It’ enough to make a true believer stop believing!!! James, thank you for the link to this article. I immediately forwarded it to my Congressman and Senator. Maybe (just possibly, he said with fingers crossed), the right staffer will read it, share it, and maybe someone will act on it. But, since I really enjoy living, I won’t hold my breath. I totally agree with “Given the discretion to do so, financial regulators will always do the wrong thing.” Especially if “given the discretion” means that the financial regulators are left alone to regulate and there are no other stakeholders different from the banks participating in the decision making. You see, I find it to be unethical to avert a financial crisis if the cost of such aversion is averting development and human improvement. The absence of financial crisis might just signify the absence of sufficient risk taking which can lead to other and worse types of crisis. But when the author writes “There was nothing new or different about the recent financial crisis, other than its scale.”, then I must wholeheartedly disagree. This crisis is definitely different from any other in that it originated directly from the regulators playing gods, arrogantly thinking they knew what risk is and that between them and the credit rating agencies, they could manage it. 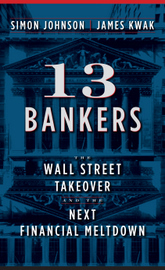 The regulators doomed this crisis to happen when they introduced the mother of all pro-cyclical forces, namely that of, in a discriminatory and not so transparent way, dramatically lowering the capital requirements for banks on anything perceived as low risk, the AAAs of this world; those which already benefitted from lower risk spreads. Can we end the charade that mere mortals (regulators) have any real power over immortal limited liability pure profit entities? The corporate charter system is simply the old aristocratic divine right mantra updated with a few bells and whistles to fool the citizenry into handing over power with no strings attached. It is state laws that must be reformed to include individual liability for management and boards of directors for “corporate” malfeasance; to require a public good component; and to mandate charter revocation for designated acts. Corporate charters are a state bestowed privilege and ought be subject to the same requirements as any other licensing from nail technicians to physicians. It won’t happen of course because personal responsibility, like taxes is for the subjects, not the lords. Notice that the de-regulatory crowd never characterizes corporate statutes as government interference in free markets when it is the ultimate interference that limits personal responsibility for bad acts and outcomes. Isn’t that the ultimate moral hazard? Yes, it is. This is the most insightful thing I’ve ever read on this site.